Today is just the beginning of our 90 degree stretch. 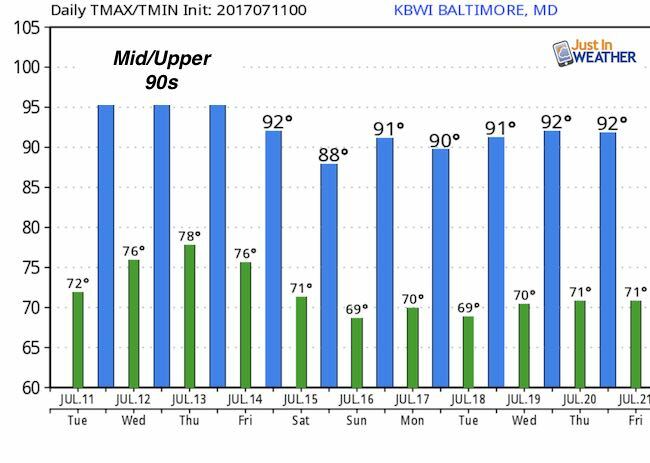 The higher heat will eventually be followed by even more humidity, making for a true heat wave. The worst of the heat should be Thursday, with the peak of the storms building Thursday evening and into Friday. The best bet is that we improve by the weekend. But first we must get through today. We have a slight chance of storms with severe potential of high winds and hail. The heat will fuel that. Here is look at the radar simulation. I also want to point out that our local Doppler Radar at Sterling, VA labeled KLWX is down for scheduled maintenance. So some of your phone apps may not pick up on the regional periphery of radars.. and it will be a little more challenging to track.